Recently I got a cheap GPS module from ebay, NEO-6M. They said that this is flight controller, but position fix is good only on really flat area. When I made a library, I’ve connected my SDcard to STM32F4 to save data, result are here. To communicate with STM32F4 device, USART is in use. Most GPS modules have by default 9600 baudrate and 1Hz refresh rate of sending data. I got my GPS configured in 115200 baudrate and 5Hz refresh rate, so when you try example, make sure that you change your baudrate to correct value. When you plug your GPS to power, it can take some time to get first valid signal from satellites. This time can be up to one minute, according to where you are trying to get signal. If you are interested in HAL version of the same library, click here. GPGGA and GPRMC should be returned from all GPS receivers, but others 2 are maybe not. Everything depends on GPS configuration. There are some tools on net, to change GPS module’s settings, like one here. When you enable these defines, my library will ignore statements, which are disabled and response like we have new data. These two options were added in version 1.1. Distance between 2 points can not be provided from GPS receiver, so we have to calculate it. This is useful, if you have let’s say quadcopter and you want to know, how far you are from quad. FIrst coordinate will be quad’s current position from GPS and second point will be set before you start with your flight. If you want to make let’s say “Return home” function on quadcopter, bearing comes to be very useful. GPS module tells you your direction (included in library) where you are currently moving. Still, first coordinate is from quad’s GPS receiver, and second is where quad started with flight. When you activate “Return home” function, quad will know how far he is from “home” and in which direction (bearing) he has to move according to the north. Then, you just have to compare your calculated bearing with actual direction provided from GPS. And you will know, if he needs to go more left, right, etc. Library supports by default 4 statements. It assumes that every GPS module should output these 4 statements. But it may happen, that your module outputs data that you need, but are not available with my library by default. Here is why custom GPS statements come handy. It is possible to define custom statements which will be parsed as strings from GPS receiver directly to user. This statement is now added into main GPS_Data structure and also, pointer to small GPRMB.3 structure is returned. You just have to make sure, that in this case, GPRMB statement is really returned from module. If module will not return this statement, you will not be able to read anything from library because it will never happen that everything will be updated before new data are available. 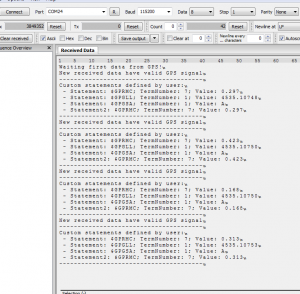 How to handle that data, you should look at bottom example about custom GPS statements. * @note GPS has longitude, latitude, altitude, etc.. in float format. * But, if you want to make a tracker and save data to SD card, there is a problem, because FATFS library breaks %f with sprintf() function. * For that purpose I made a new function TM_GPS_ConvertFloat() which converts float number to an integer and decimal part. 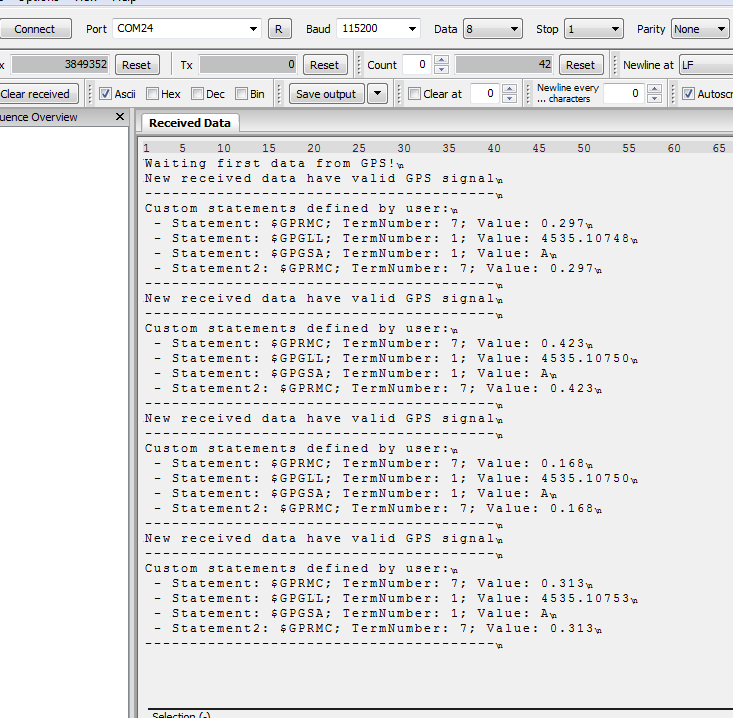 char Value; /*!< Value from GPS receiver at given statement and term number will be stored here. uint8_t SatelliteIDs; /*!< Array with IDs of satellites in use. TM_GPS_Custom_t* CustomStatements[GPS_CUSTOM_NUMBER]; /*!< Array of pointers for custom GPS NMEA statements, selected by user. * @note GPS baudrate can have other values. Check GPS datasheet for proper info. * @brief Update GPS data. * @note This function must be called periodically, as fast as possible. * It basically checks if data is available on GPS USART and parse it to useful data for user. * @note - When you first call this function and there is not available data from GPS, this function will return @ref TM_GPS_Result_FirstTimeWaiting. * - This will be returning all the time we don't have any useful data. * - When first time useful data is received from GPS (everything parsed), @ref TM_GPS_Result_NewData will be returned. * - When we have already new data, next time we call this function, @ref TM_GPS_Result_OldData will be returning until we don't receive new packet of useful data. * @note If you are making GPS logger, then when you receive @ref TM_GPS_Result_NewData it is time to save your data. * @param toSpeed: Select to which speed you want conversion from knot. This parameter ca be a value of TM_GPS_Speed_t enumeration. * @brief Adds custom GPG statement to array of user selectable statements. * @note Functions uses @ref malloc() function to allocate memory, so make sure you have enough heap memory available. * @ref TM_GPS_Update() function will always return that there is not data available to read. View projects at Github, download library below.